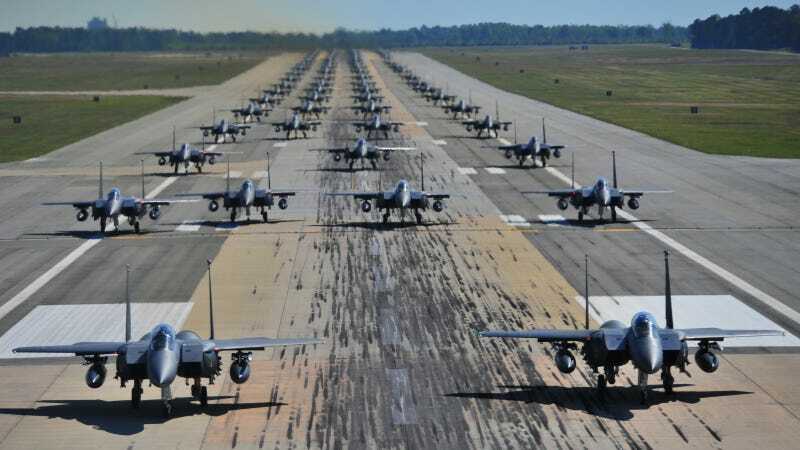 If you were impressed by the elephant walk of twenty-seven F-16 Fighting Falcons taxying down the runway, fully armed and ready for immediate take off and battle, check out these seventy (70!) F-15E Strike Eagles doing exactly the same. They got together for one purpose: celebrate the destruction of Nazis! U.S. Air Force F-15E Strike Eagle fighter aircraft of the 4th Fighter Wing perform an "Elephant Walk" as they taxi down the runway during a Turkey Shoot training mission on Seymour Johnson Air Force Base, N.C., April 16, 2012. The wing generated nearly 70 aircraft to destroy more than 1,000 targets on bombing ranges across the state to commemorate the 4th's victory over the Luftwaffe April 16, 1945. The aircrews are assigned to the 4th Fighter Wing's 333rd, 334th, 335th, and 336th Fighter Squadrons.